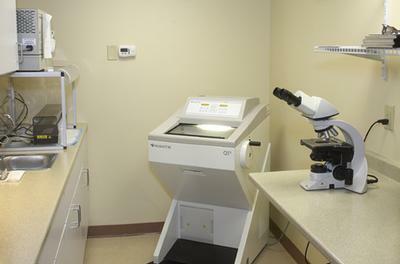 Bates Mill Dermatology offers Mohs micrographic surgery for treatment of skin cancers. Mohs surgery is a method of removing skin cancer (most often basal cell and squamous cell carcinoma) with narrow margins, then checking under the microscope to make sure all the cancer cells are removed. If more cancer cells are seen at the edge of what has been removed then another small layer of skin is taken and checked again. This process is continued until the margins are clear. This allows removal of the cancer with a 98-99% cure rate and the smallest amount of normal skin removed. After removal of the cancer the area is typically closed with sutures, sometimes a skin graft, depending on the location of the tumor.